After the success of its bestseller Vulcano 2.0, the vibrating screen on a radio-controlled self-propelled track vehicle, and of the most recent Vulcano XXL, the innovative extra-large model with enhanced performance, Laurini Officine Meccaniche has launched the Vulcano Smart. Ideal for small and medium jobs, this version was developed and produced to meet the heterogeneous needs of worksites on five continents. Vulcano Smart guarantees hourly production of up to 200 m3, thanks to the Caterpillar C4.4 143 cv engine. It is compact and can be transported without a permit, as its shipping width is only 2.5 m. and it weighs 21 000 kg. An authentic revolution in the field of screening padding machines, Vulcano Smart is a product of the profoundly customer-oriented philosophy of the company, which never neglects research and development to satisfy its clientele in every way. 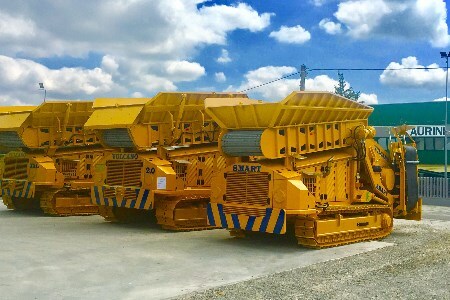 The high reliability of this new model makes it an extremely versatile machine, suitable for many different types of terrain and adequate for multiple track configurations. Laurini Officine Meccaniche has always been based in the province of Parma and just this year expanded its premises, with the inauguration of a new area of about 200 m2 where the technical office and meeting rooms are located. 2017 also ushered in the construction of a new factory shed occupying 1500 m2 across from the main offices, which houses a new assembly department.